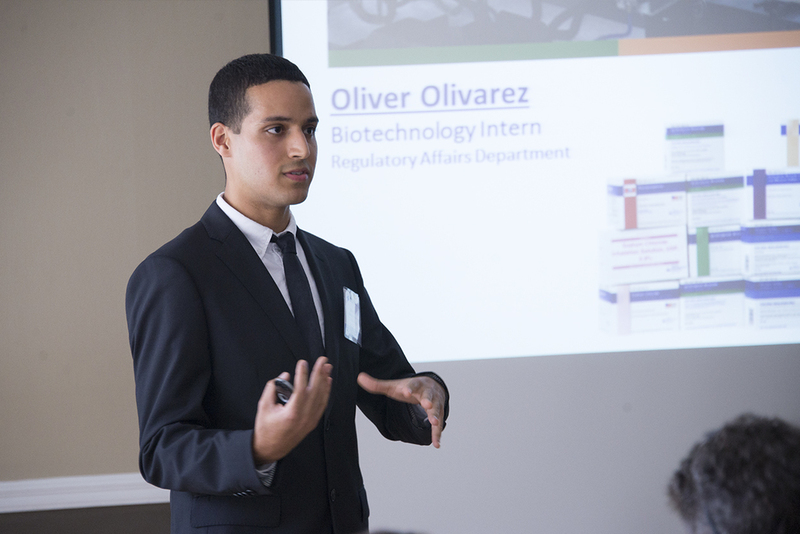 Biotechnology PSM student Oliver Olivarez presenting at PSM Day. The presenters were joined by twenty industry partners and thirty current PSM students who will complete their internships in the future and hoped to learn more about the possibilities. This event was a first for the UCF College of Graduate Studies and provided an opportunity for the students in this career-oriented degree to showcase their abilities to potential employers and network with those in their chosen field. The industry partners represented a variety of scientific companies around central Florida with most attendees at the Director, CEO, or Company President level. With such strong support from industry, it was a resounding success and the winners were the students. Following presentations, students networked with the industry partners regarding future internships, job placements, and their thoughts on the current and future trends in the field. This was a unique opportunity for graduate students and many commented how beneficial they felt the experience was. A PSM degree is designed to create opportunities to link industry with education to create a feedback loop to improve both. While many degrees in graduate education focus on research experiences, PSM degrees are designed for students who want to go directly into industry upon graduation and benefit from the hands-on internships. While the introduction of PSM degrees into higher education is a recent movement, it has grown exponentially to over 340 programs at almost 160 institutions (cite). This growth signals a student and industry-driven desire for more applied graduate education options and PSM degrees aim to meet that need. PSM Day is an annual event that occurred on Sept 10, 2015. The tentative date for next year’s event is Sept 8, 2016 and all UCF students, faculty, and staff are invited to attend. For more information on PSM Programs please visit:www.graduatecatalog.ucf.edu and search for PSM or email GradPSM@ucf.edu.